Everyday I go through all of the new listings on the MLS looking good design. 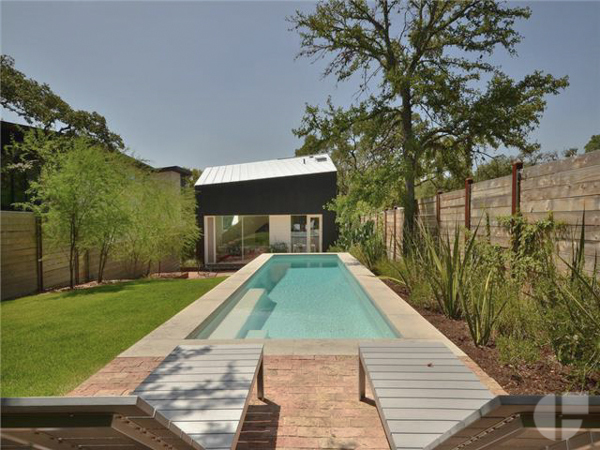 I share all of my favorite new modern and mid century modern listings on my Austin Modern Homes blog. You can check them out there, or if you are looking for something specific, you can search for certain areas or styles on my modern home search page. Of course, if you need any help, feel free to contact me. Two attached duplexes in a row, what are the chances. I have to admit I don’t love the look of this one as much from the outside, it’s a bit plain, even for my taste. I do however think it’s a very smart and well laid out floor plan and the interiors look well done. I’m usually not a huge fan of connected duplexes, but I appreciate the symmetry of this one. More importantly though I really love the interior, and that’s something I thought I would never say about a house with a green kitchen. Icing on the cake is the sub $500k price tag and 3 bedrooms. One of the biggest bummers of my job is the daily realization of just how little affordable housing there is in Austin these days. That’s what makes me love a house like this, it’s not huge, nor is it in the coolest neighborhood, but it’s a well remodeled turnkey home that could be had for close to what you are probably paying for rent right now. Well shucks. There just really isn’t anything better than a good flat roofed mid century modern home. This one isn’t much to look at on the inside, but just think of it as a blank slate. A big beautiful blank slate. Bonus; all the boring stuff (plumbing, wiring, windows) have already been updated.